Destiny Xur update: should you buy Year 2 Red Death? Is Red Death as scary as its name makes it out to be? 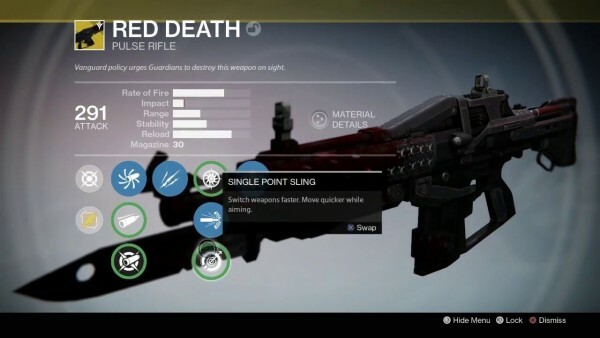 Red Death, one of Destiny’s killer PvP weapons in Year 1, is among Xur’s inventory this weekend. That’s the Year 2 version, obviously, but does it remain a solid choice? Red Death’s Crucible status has somewhat diminished, but it’s still among the best PvP weapons. In Iron Banner and Trials of Osiris – where power matters, the weapon is one of the best you could have. In PvE, and although it lacks elemental damage, the Red Death perk comes in handy in Nightfalls where your shields don’t replenish. The perk heals you every time you land a kill. Red Death is also useful in certain raid encounters where you’re faced with a large number of enemies. In short, it’s worth your coins, but don’t be surprised if you run into Red Death players more often.